Smokin' E﻿﻿lvi﻿﻿ses BBQ Boot Camp is now open! Have you ever wanted to learn how to BBQ like the Pros? Now you can at the Smokin' Elvises BBQ Boot Camp! 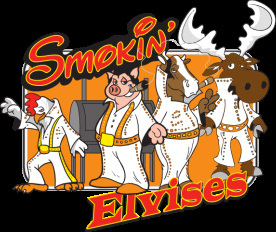 Join the Smokin' Elvises on their quest for BBQ glory and learn all the tricks of competition BBQ. Work side by side with the Smokin' Elvises Pit Master as we create some of the best competition BBQ on the KCBS circuit. You will compete against some of the top teams in the country and get to learn first hand what it's like in the "heat" of BBQ battle! Whether you are a novice just learning how to BBQ or a seasoned veteran looking for some new tricks, you can join us at one of the over 15 competitions we attend each year. From choosing the meats & seasoning, to cook times & techniques, we will teach everything you need to know for great back yard BBQ or give you a chicken leg up on starting your very own competition BBQ team! Basic packages start at just $300 per person and include your all access pass to the competition site, overnight accommodations, official Smokin' Elvis team shirt and all the BBQ information you can stand. Drop us a line via our website or SmokinElvises@gmail.com and we will send you all the details. Hurry though, participants are limited and contest fill up quickly.